When my sisters and I were little girls, any miniatures that we acquired eventually ended up in the Barbies' possession: Fish Pond and bubblegum machine and Cracker Jack trinkets; small Christmas decorations; itty-bitty knickknacks. And my Easy-Bake Oven. I don't know whatever happened to my Easy-Bake Oven. I was at a toy show in Dayton, Ohio, on Nov. 10 and found an identical one for $5, so of course I bought it. I took it apart and cleaned it. Miraculously, one of the infamous lightbulbs still worked! So I had to replace only the other bulb. You've probably read that 100-watt incandescent bulbs don't exist anymore and the new twirly ones don't give off enough heat to cook anything. Thank heavens for Google; I found a blog in which the writer stated that GE Reveal 26-watt bulbs will work, so I bought a set. I kept the working incandescent bulb in the oven and replaced the non-working one with a 26-watt (100 watt comparable) CFL twirly. So what did I bake? I bought a Jiffy blueberry muffin mix and made eight regular muffins in my muffin tins in my regular oven. I saved a bit of the mix and poured it into one of the Kenner EBO pans. I lined the pan with foil. I baked the huge flat muffin for about 15 minutes, and it puffed up like it was supposed to. The one detail I neglected was that I should have sprayed the foil with Pam because I couldn't get the EBO muffin out! I ended up spooning it in pieces onto a plate, and placed a pat of butter on top of it and ate it with a fork. I was concerned about the "muffin" being undercooked, but actually I overbaked it a bit because it was just a bit dry. Other than that it was edible. As for being Barbie-sized: One advantage of being an adult long-time Barbie collector is that you don't have to "make do" with setting up scenes any more; that is, having to use substitutes for items you don't own. It was soooo nice having a bunch of 1968 Barbies and friends, whom I redressed in--you guessed it--turquoise! I know turquoise was a 60s color but it never registered with me before that a bunch of Barbie's ensembles from '68 were made of that color. The girls are in the kitchen during a party, because they are all dressed up. The dolls are (left to right) Brunette Talking Barbie in Togetherness; brunette (actually black hair) Twist N Turn Barbie in Knit Hit; Twist N Turn Stacey in Swirly Cue; Twist N Turn Skipper in Posy Party; and Talking Stacey in Zokko! Talking Barbie has kicked off her shoes and Talking Stacey never did have the boots for the dress. The purple and green seats came with the Talking Barbie and Stacey that my sister and I received in 1968. Those two dolls are long gone but we still have the stools! Everything else in the photo I purchased as an adult collector. The pots and pans and dishes are from 1979's Campin' Out playset. Did you realize that the two talking dolls have their ponytails on opposite sides of their heads? Did you ever notice that when you sit a Barbie down with her knees slightly bent that her feet touch the floor flat? The TNT Barbie had the worst asymmetrical child-provided haircut I have ever seen, so I attempted to French braid her hair. She looks a little like Katniss now! I think that this photo was a "bucket list" type of scene. I very likely had imagined a similar scene to this as a little girl but did not have the means (that is, the "stuff") to actually create it. Another fantasy from my childhood list crossed off! 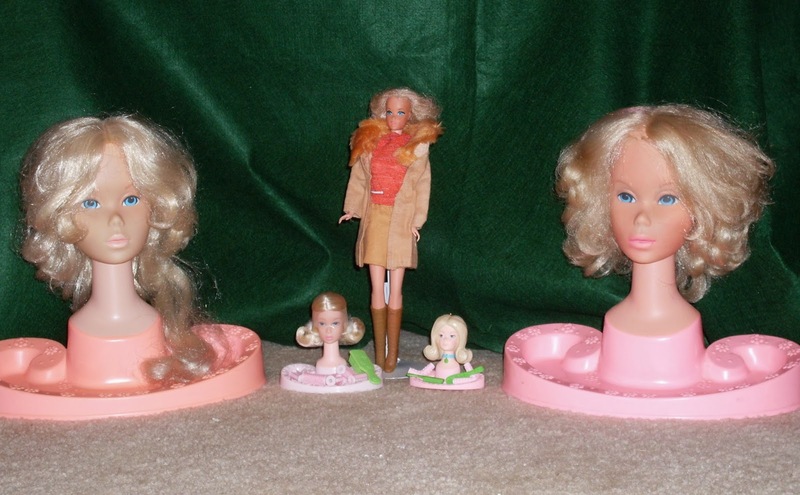 I now have the original Barbie styling head, and three versions of the second one (sort of). The first Barbie head was sold in 1973, the Growin' Pretty Hair Barbie Beauty Center (box dated 1972), #4027. It was an international effort making her, as the countries listed on the box are Japan, Hong Kong, Mexico and the United States! The head has very light blonde hair and has a ponytail to be styled. The box's sample faces have two very different "attitudes," one of a big-eyed innocent young teen girl with long hair; the other of a cool, distant, sophisticated young California woman. The base is an apricot color. It's the 1975 head that everyone remembers. 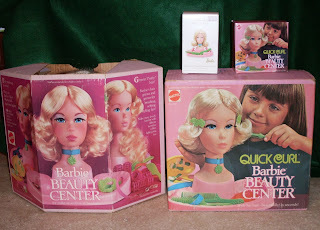 It's the Quick Curl Barbie Beauty Center, same stock number, dated 1974 for the 1975 market. The head was made in Mexico and the accessories in the US. Like the Quick Curl dolls, the hair has gold wires running through it. Like the Quick Curl dolls, it's almost impossible to restore the tangled frizzed hair to its original condition. The base is pink. Both heads have the same accessories, including false eyelashes. I have two smaller, recent versions of the Quick Curl head, each with a different purpose. In 2008, Mattel sold a smaller head with real hair for its American Girl Julie Albright, who lives in the 1970s. Its official name is "Julie's Christmas Gift," stock number 0851-3107, made in China, box date 2007. I own both Julie and a previous AG girl, Kirsten, and many of their outfits and accessories, but the Quick Curl head is stored with my Barbie stuff, not my AG stuff. The head itself is about 1/2 inch longer than an actual Barbie head. The curlers and brush are real. The second one is a Hallmark ornament sold in 2012. It's simply called "Quick Curl Barbie Beauty Center," and it is all molded, like Ken's hair is molded, and the curlers are permanently attached to the base. The head is about 1/4 inch smaller than the actual doll's. It was made in China, of course, with a stock number of 02711. I have two photos to show you, one of the heads themselves, the other of the boxes. My Quick Curl Barbie is wearing #8681 Chic and Neat and #8682 New Fashion Coat, all from 1973. She looks like a preppy character from Love Story or Our Time. I've listed two items on epier and one one etsy.